Dorothy Rudd Moore: Frederick Douglass "I've Been a Slave"
Ulysses Kay: Frederick Douglass "Still in Their Chains"
Songs of Separation: "Idolatry", "Poem", "Parted"
Several months I ago I heard Kevin Maynor's Paul Robeson tribute album on Fleur de Son (FDS57929) and was mightily impressed with the voice, which evoked Robeson's without artifice or imitation. 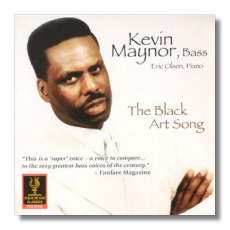 Now Maynor has recorded a disc of songs (actually, there are a couple of arias, and an arrangement of a traditional work song) by Black American composers. I've never seen a CD with a similar theme, and it's an important one: how many Black American composers can you name? Sometimes theme albums run the risk of stopping objective evaluation by sequestering their contents in a "special" category. Fortunately, there's nothing on this CD that can't stand up on its own, even without the unifying theme. And the theme, of course, is the Black experience, but also oppression and anticipated triumph. Some of the songs address the theme directly though references to men such as Stephen Biko (Hale Smith's The Martyr) and Martin Luther King, Jr. (David Baker's A Good Assassination). Frederick Douglass is here too (arias by Dorothy Rudd Moore and Ulysses Kay), but so are the slaves and the minstrels, and those who are sent to eat in the kitchen when White company comes. Other songs address the theme more obliquely. The musical styles vary from traditional song to a more contemporary expressiveness. Some of the songs fairly burst their medium. Try, for example, Florence B. Price's melodically ecstatic Song to the Dark Virgin, which seems to call out for an orchestral accompaniment. Great art is a machine that creates compassion, and The Black Art Song creates compassion over and over again from one song to the next. There are no printed texts. Maynor's diction is very good, but I have to confess that the sound of his voice is so rich that it can distract me from the words, so perhaps it would have been good if texts had been included anyway. Instead, there are one- to three-sentence biographies of the composers, written, I think, by Maynor himself. These aren't very useful; I would have preferred to know in what year each of the composers was born, at least. The songs all speak for themselves. Nevertheless, I am left wanting to know more about them, including the author of the texts! I want more context so I can appreciate the songs even more. The recording puts Maynor's commanding and resonant voice well in the foreground; the piano almost seems to be in a different acoustic environment, and its tone is pale next to Maynor's voice. Then again, almost anything would pale in comparison to Maynor's voice! It has been compared to Robeson's and Pinza's, but only time will tell whether Maynor will ascend to the level of these great singers. I'm betting on him, though.